Oval Tiger Eye stones set in hand crafted sterling silver earrings with french wires. 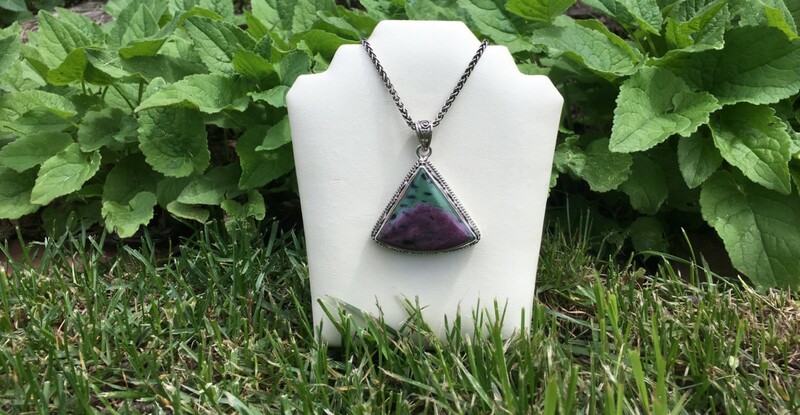 Large Trillion Ruby Zoisite in hand crafted sterling silver pendant with fine filigree. 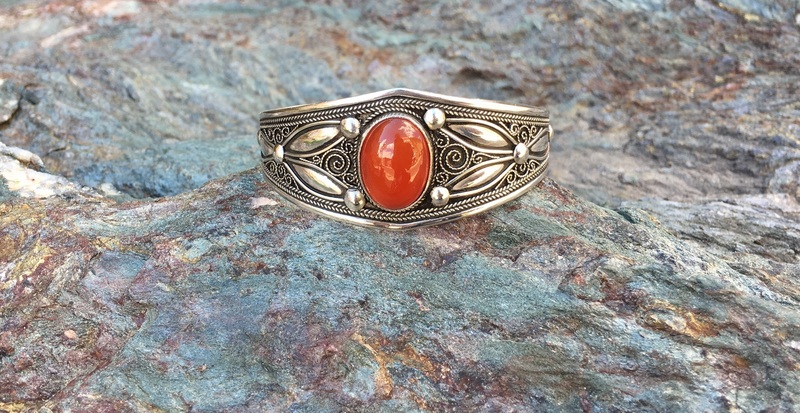 Amazing Mexican Fire Agate in hand crafted sterling silver setting. This one of a kind pendant was designed by Georgette of Deadwood. Beautiful Teepee Canyon Agate with Amethyst Crystals set in hand crafted sterling silver pendant. This one of a kind piece was designed by Georgette of Deadwood. This hand crafted sterling silver bracelet is set with five gorgeous Blue Lace agate stones. Toggle clasp and three rings allow for length options. Seven Blue Labradorite stones in hand crafted sterling silver bracelet. Lobster clasp and multiple rings allow for length options. Hand crafted sterling silver bracelet is set with dark green Jade. Toggle clasp and three rings allow for length options. Hand crafted bracelet is strung with Tibetan Turquoise, Rose Quartz, and sterling silver Bali beads. Bracelet has a toggle clasp and measures 8 1/4 inches long. Beautiful Tiger eye stones on sturdy stretchy cord. This hand crafted sterling silver bracelet is set with stunning Sardonyx and Pearl. Toggle clasp and three rings allow for length options. This hand crafted sterling silver pendant is set with a stunning white Druzy. This one of a kind piece was designed by Georgette of Deadwood.